Windows Live OneCare is a computer security service which integrates anti-virus program, firewall, backup and restore utility to supplement integrated Windows Defender for malware and spyware protection. 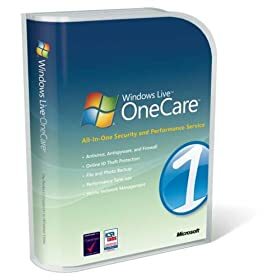 Windows Live OneCare is developed by Microsoft for Windows XP and Vista (including both x86 and x64) operating systems. Avira Premium Security Suite is the “premium” version of security protection software from Avira, and costs a more expensive price of € 39.95 for 1 home PC license annually. Avira Premium Security Suite integrates all features of Avira AntiVir Premium (although it also has the word “Premium” as brand) to secure and protect the computer from virus, worm, Trojan, spyware, adware, spam, phishing site, rootkit, malicious website drive-by, plus anti-phishing, anti-spam, anti-bot, firewall capable of mitigating DDoS attacks and port scans, BackupSystem for data backup and a game mode that suppress pop-up dialog during gaming session. Avira not only has promotional offer together with VNU Publications for ComputerActive and Personal Computer World reader, it also giveaways free license key of Avira AntiVir PersonalEdition Premium (now known as Avira AntiVir Premium) exclusively for the readers of Dennis Publications magazines, Computer Buyer, Computer Shopper and PC Pro (but anyone can register). Outpost Firewall Pro is a personal firewall security software developed by the Agnitum, a Russian company. Outpost Firewall Pro license costs $39.95 with 1 year of updates and support subscription, which can be renewed for $19.95 annually, although user can continue to use Outpost Firewall Pro forever for unlimited times with no restriction after license expires. SecureZIP, previously known as PKZip Professional, although has a ‘ZIP’ on its name, is not just a compression and decompression utility. SecureZIP is an integrated security and compression tool that not only zips and unzips files, but also encrypts the files to securely protecting data in transmission, transfer, transit or been stored on computer that contain sensitive data. Is 90-days free subscription license key code for BitDefender Total Security 2008 is not good enough (or not long enough) for you? Or BitDefender Total Security takes up too many system resources and want just anti-virus program? If so, apply for another 90-day free subscription license key, this time a giveaway promotion by BitDefender Italy, which makes up altogether 180 days in free usage. Best of all, user can choose from all three main BitDefender security products – BitDefender Total Security 2008, BitDefender Internet Security 2008 or BitDefender AntiVirus 2008. BitDefender Total Security is the top of the line ultimate security product from BitDefender which features real-time antivirus protection, proactive protection, anti-rootkit, gamer mode that uses lesser resources, privacy protection, anti-spyware, web/email anti-phishing, firewall protection, Wi-Fi wireless protection, anti-email spam, parental control, web time limiter, application control, data backup, PC tune up, and trace clean-up. With almost all popular anti-virus vendors giving away free license and updates subscription free period (for example, free Spyware Doctor with AntiVirus, free 1 year license of iolo Antivirus, free 90-day ESET Smart Security user name and password, free 6-month Avira AntiVir Premium 8 license, and free AVG 8.0 Anti-Virus), we certainly do not expect Kaspersky to be left out. In fact, Kaspersky is giving away its premium Kaspersky Internet Secuurity 7.0 (KIS 7) product.